Good find (to hell with the money!) - too bad about the lack of a photograph (aka Image). 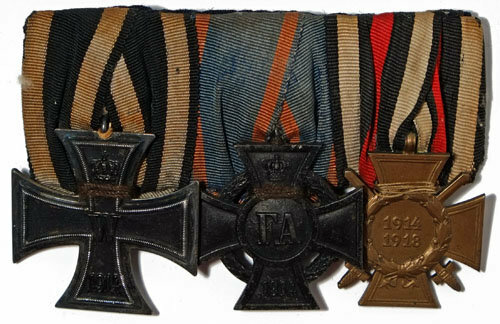 Here again, you can nestle the Hindenburgkreuz ribbon, and that of the III Klasse medal, around the hanging devices, so that these are tucked out of sight. 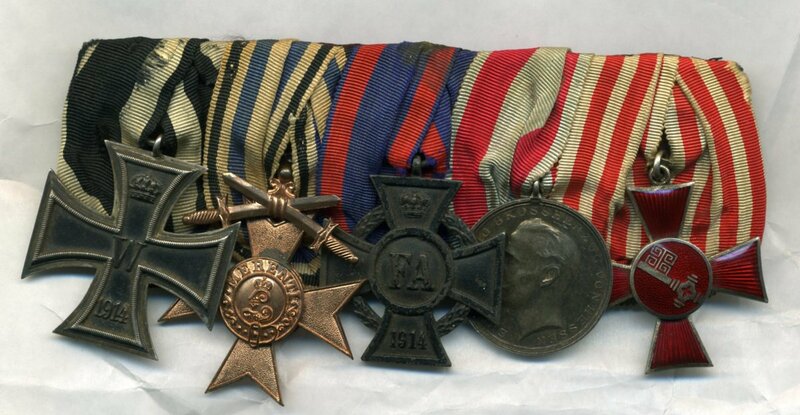 Actually KIm, perhaps you can help me understand the reason why a number of WW1 soldiers were awarded the Bavarian Dienstauszeichnung 3.Klasse 1913 medal for nine years service - I have no books on this. 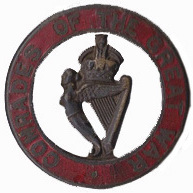 I assume that when first introduced it was awarded to the core element / cadre of the various Bavarian regiments, the long-service guys who kept the machine going during the successive conscription periods. 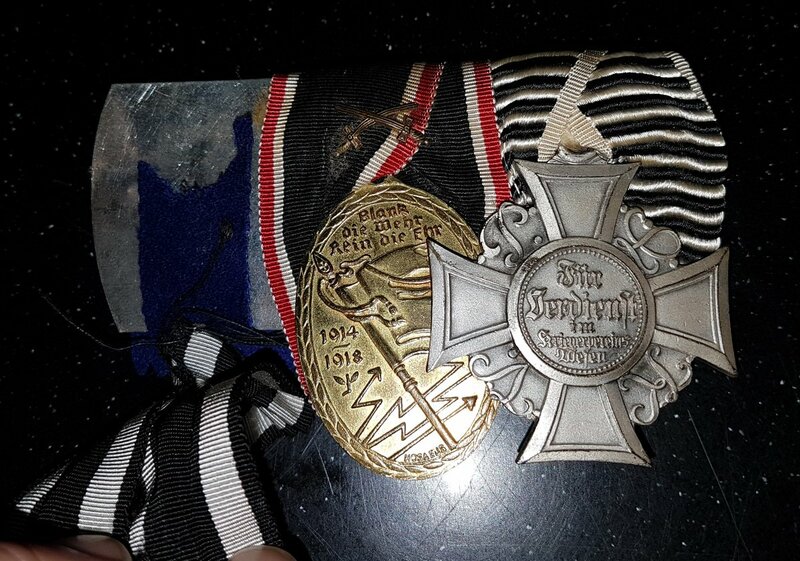 But several Bavrian groups include this medal, and some of these - as with mine - went to men who served in WW1 only. 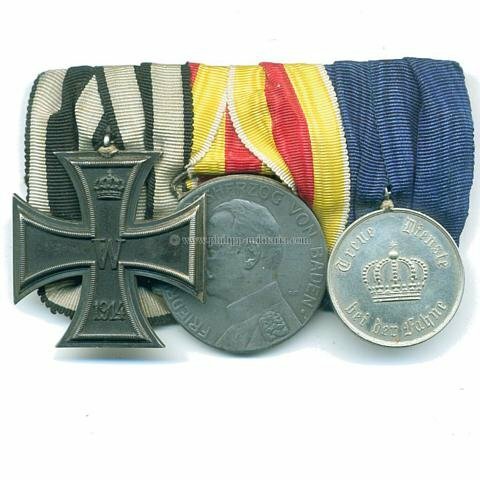 I know that during the Weimar period, it was a given that one year's service in WW1 was equal to two years normal service, so did this apply to these Dienstauszeichnung 3.Klasse 1913 award also, i.e., 1914-1919 war service counted as nine normal service years? If I'm not mistaken, war years counted double for the Dienstauszeichnungen. That's what I am thinking... My only supporting 'evidence' is a Bavarian regulation of 1919 concerning the wearing of bayonets which states that with regard to GW 'veterans' in the Reichswehr, and their right to wear their GW service bayonet, each war year equalled two normal years. I can confirm from an official source that war years counted double (information from "Auskunftsbuch der 3. Armee"). Hoping to recreate the group so any tips appreciated! You have it just about right. It just needs a bit of sewing! I attach some similar ones . You could see to it that the crossed swords are not covered (just nestle the EKII ribbon under the left part of the swords). Thanks for that Kim, and especially the swords tip. I have a group whereby the ribbons are more-or-less mounted in reverse (for some reason: Widow? ), attached for your general interest. Cheers Kim. Is there an order of wear for Imperial/ Weimar awards? It must run to several volumes! I have not seen an Order of Wear. 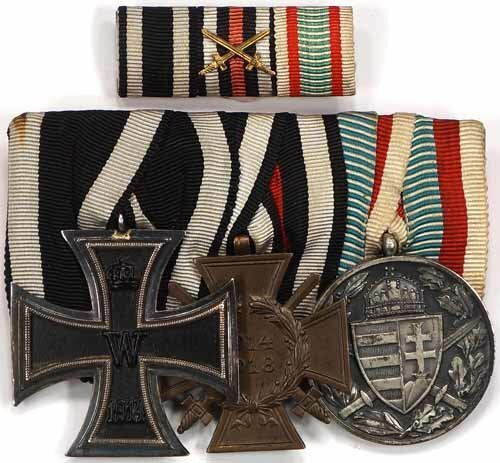 One must bear in mind that it depended on which State/Principality etc the officer/soldier belonged to: i.e., a Bavarian would wear his Bavarian decoration before/in front of his Prussian or Baden etc., decoration. Makes sense. An impressive array of gongs Kim! Interesting one! 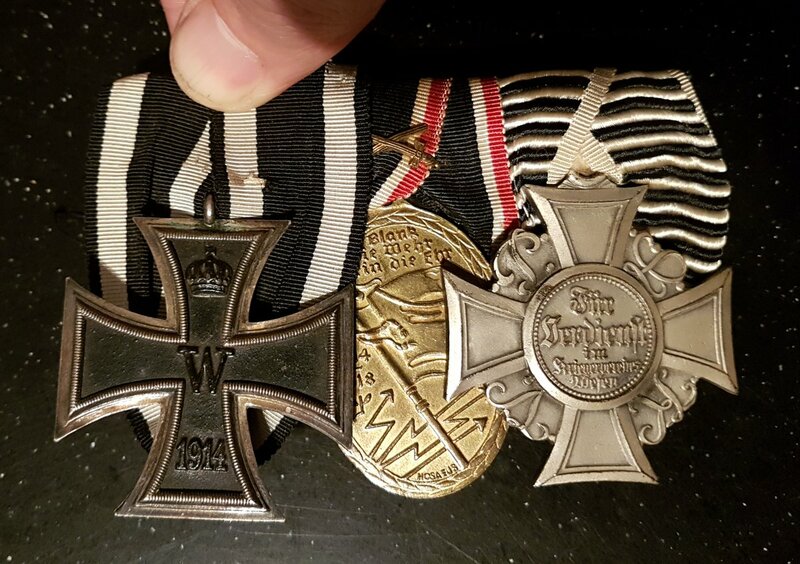 Yes, most probably an EK II, given how so many were awarded, but I have seen something similar recently over here with a Bavarian merit cross, a 10 year medal and, I think, a Kyffhäuserbund... Didn't buy it as the seller wanted too much and the ribbons were very faded, but certainly no EK II in that group! .... 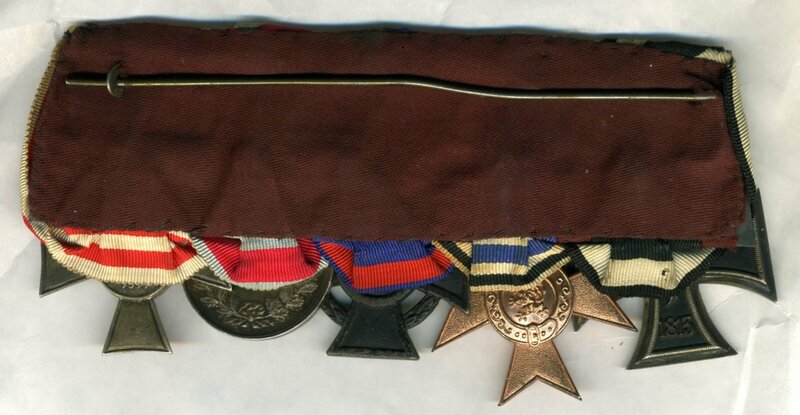 I have a group whereby the ribbons are more-or-less mounted in reverse (for some reason: Widow? ), attached for your general interest. I am missing something on the "reverse" aspect - kindly elucidate! ... I have not seen an Order of Wear.